Very Positive (115) - 100% of the 115 user reviews for this game are positive. “Early Access focuses on the meat of the game: The upgrade system and game balance. 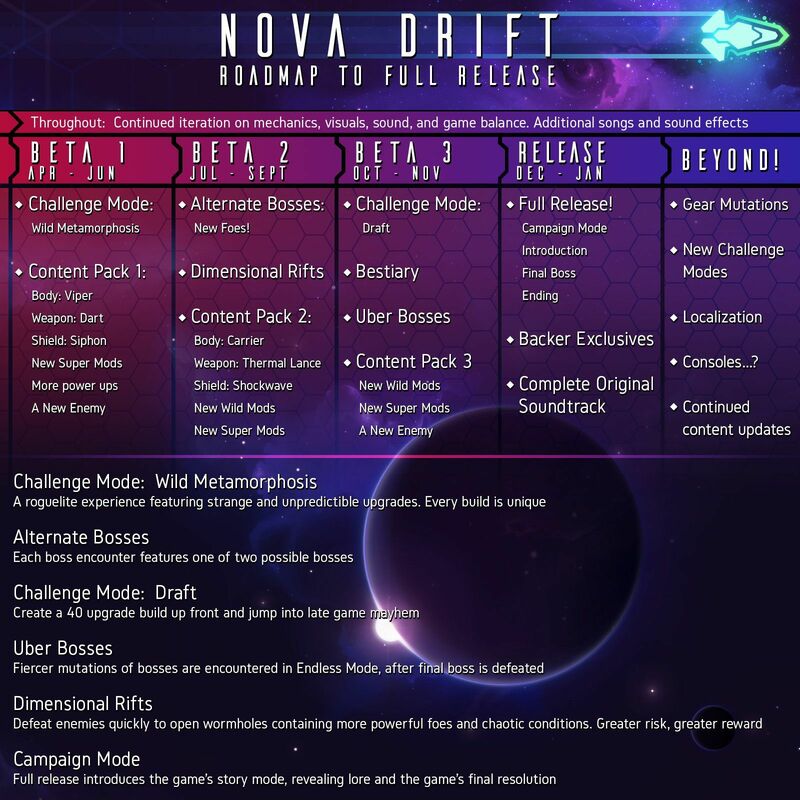 Nova Drift's endless mode is a perfect arena to focus test player abilities, enemy capabilities, and game flow. The full version will include the campaign: a game mode with exposition, an introduction, and a game ending. Additionally, the final version will include the game's final boss fight. “Nova Drift has been community driven for the greater majority of its development cycle, thriving on feedback and player suggestions. The game will continue to value this relationship throughout its lifespan, long after full release, as more content is deployed. We hope everyone has been enjoying the game so far. We've listened to your feedback (there was a lot of it!) and have put together the first major update to the game, which should be waiting for you in the main branch... you might have to restart Steam to get it. There are a few ways you learn about the updates. If you just want a summary, read below or check this big tweet . Bonus points for RT'ing to boost the signal! You can read the entire report / patch notes here. This update focuses on quality-of-life changes, balance, and raising the power level of several formerly uncompetitive loadouts such as engineer and architect construct builds, shielded construct builds, and Siege Weaponry / Saturation Fire builds. Construct AI has been given quite a few advancements, including the ability to lead their targets, dodge hazards, and multitask while repositioning. They're generally more graceful and well positioned. These changes, combined with the addition of level-scaled assembly time, have given constructs far greater sustain in late waves. Buffs have also been given to Apex Machinery and Shielded Constructs, which is now quite viable defensively, compared to other defensive set ups. Self-Damage systems such as Siege Weaponry, Saturation Fire, and Antimatter Rounds have been rebalanced and made more dynamic. Siege Weaponry no longer damages you on the first strike, provides more benefit up front, and spools up smoothly. Saturation Fire now allows the full range of calibrate's affects and works with more set ups. If you've ever wanted to convert Pulse into a long range auto-shotgun, now you can! Additionally, there are quite a few new small features: The Stealth body gets bonus damage when breaking stealth, the game has been zoomed out, a new music track has been added, burn damage numbers can be shown, more statistics are displayed, and many bugs have been fixed along with a number of sizable optimizations. For Streamers with wide aspect monitors, windowed mode is now a fixed 16:9, with more dynamic options to come. The next major update will feature new content! Also, please consider RT'ing the original launch announcement if you have not yet. Finally, join our discord community! This is the most direct way to chat with other players and submit feedback, bug reports and feature requests. Nova Drift is finally LIVE! The whole world can now drift with us and this makes us very happy. There are many content updates planned for the foreseeable future, and you can always see what's in the oven at https://blog.novadrift.io. Please leave a review and tell your friends! This build takes advantage of the Hullbreaker's speed and resilience to crash damage to slam directly into enemies. The fragile Amp Shield is used not for defense, but to augment Hullbreaker's strongest aspects, gaining increased speed and force. The shield will break on impact, but we can capitalize on that using the Volatile Shields mod, which detonates the shield when it goes down, blasting all nearby enemies. Flash Shielding gets it running again quickly while Emergency Systems grant a moment of damage immunity, making charge attacks safer. Finally, Celestial Lance is used to deal burning damage to everything around the ship at high velocities!